This is the ultimate sniper! The Ultimate Sniper Paintball Marker with Insane Power and Accuracy! The Tippmann A5 SOCOM sniper paintball rifle is the most realistic 50 caliber military replica that boasts terrific long range precision for sale at a cheap price. Paintball guns that stop short of their target and don't shoot far enough can really put a damper on your game. In many markers today, consistent accuracy is also a recurring problem. The Tippmann A5 SOCOM .50 cal Sniper gun will solve both of these problems in a hurry. Not only is this paintball gun a fantastic replica of the real thing, it's also built on the electrifying Tippmann A5. Cyclone fed and full of speed and power, the Tippmann A5 makes a magnificent base for one of the most powerful rifles in history. With an 18 inch Recon Rifled barrel plus another 3 inches in length from the thread-on SOCOM Silencer, your accuracy will be able to reach out and 'touch' someone from afar! You will love dialing in your targets with pinpoint precision by using the Tactical 9x32 sniper scope included with this marker. The scope is offset with a sidewinder scope mount to keep it out of the way of any hoppers and also make it useable with a mask on. The magazine included is non-functional but gives the A5 SOCOM .50 cal sniper an authentic look; it's also a great little storage compartment for a squeegee, some tools and o-rings. The bipod on this marker swivels 45 degrees in each direction for easier aiming and switching targets quickly. 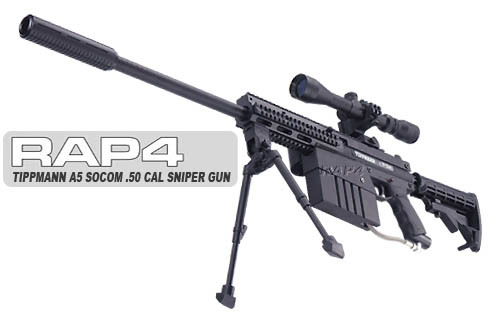 The real .50 cal sniper rifle is the ultimate in sneaking, deadly stopping power. Actually, the real rifle is not necessarily designed for shooting at people; it's so powerful, it's actually designed for stopping vehicles. However if a person should be the target, God rest his soul! A .50 cal round will nearly disintegrate a human target. Of course a paintball round won't do that (thank goodness), but now you can pretend to be the heavy sniping force on your tactical team. The .50 cal sniper is also well known for how hard it kicks back; hard enough so the shooter has to be laying on the ground to shoot it or it will knock him down! The Tippmann A5 .50 cal sniper won't kick this hard, however it's plenty powerful enough to easily rule an entire paintball field, crushing one opponent at a time. You can also add an electronic trigger to this gun if you want to (for fully automatic firing); however the A5 .50 cal sniper was really designed for a 'one shot - one kill' attitude. Buy the Tippmann A5 SOCOM .50 cal Sniper Paintball Marker at ChoicePaintballGuns to get a great price, plenty of support (if needed) and good customer service. 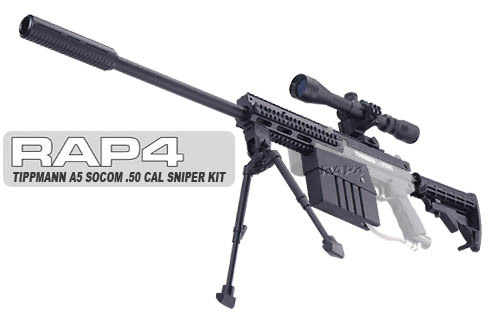 Become the heavy gunner and expert marksman at the same time with the A5 .50 cal sniper!